Nikon's new L-series model wows with its 21x zoom, but what about image quality? 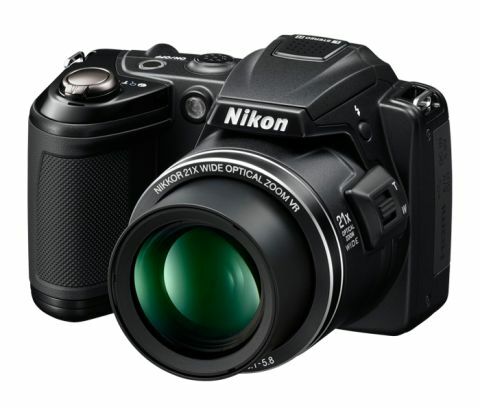 Accommodating an impressive 21x optical zoom Nikkor lens that provides a focal ability of 25-535mm (35mm equivalent), we don't have to look far to find the Nikon Coolpix L120's standout feature. What's more, the Vibration Reduction lens creeps even further with an additional 4x digital zoom, taking the overall telephoto capacity to an impressive 2100mm in 35mm format. Elsewhere, the newcomer lays claim to a 14.1MP 1/2.3 type CMOS sensor, boasts a sports continuous mode powering out 20 frames at 15fps albeit as a reduced resolution of 3MP, a 1cm close up mode for unrivalled macro shots, and a HD video mode providing a resolution of 1280 x 720 at 30fps. Whilst there is no manual mode to satisfy higher-end enthusiasts on the £249 Coolpix, photographers can affect a range of settings whilst in auto mode, including white balance, ISO, exposure compensation, metering and AF area. The camera also delivers an easy auto mode aimed at helping complete beginners and 17 dedicated scene modes for those with a basic understanding of photography. Highlights within the scene palette include Black and White copy, Close Up and Dusk/Dawn, as well as the more traditional option of Sunset. Elsewhere, Nikon houses its familiar Nikon Best Shot Selector, choosing the sharpest of ten frames taken in succession, and a Multi-Shot 16 option, which takes 16 images at 22fps combining the portfolio into one 5MP frame – both of which will undoubtedly go a long way to satisfying low-light fanatics, as well as beginners in general. Sports and action enthusiasts are also well catered for here, not only with the previously mentioned continuous mode, but set to auto the camera can take 19 frames at a rate of 0.7fps at full resolution, while a dedicated subject tracking option equips photographers with an extra level of accuracy. A Panorama Assist scene mode makes an appearance here and is fairly similar to other manufacturers take on the concept, presenting a faint outline of the previous shot leaving the shooter to carefully realign the succeeding image before firing the shutter. However, unlike the highly-praised sweep feature in the Sony range of compacts, the Nikon super zoom lacks any integrated auto-stitching facility in-camera, so owners of the L120 will need to install the incorporated Panorama Maker software on their computers before manually stitching the frames together. Again, other brands have one-click solutions for this embedded within their dedicated apps – here we lament the absence of such a useful provision. Another potential issue with the scene mode is that it locks both exposure and white balance based on the values of the first shot. This presents a few obvious benefits in controlled lighting conditions, but for the majority of outdoor scenarios, where this feature is most-likely to be put into use, the results can be extremely hit and miss. A small sample of colour options is included, namely Standard, Black and White, Cyanotype, Sepia and Vivid. Although this provides a basis for creativity, some users may be disappointed by the somewhat shallow range of this palette, as other brands like Olympus and Canon offer a wider gamut of creative filters incorporating novel and useful items, such as fish-eye, miniature, pinhole and sketch.